Here begins the main argument of the lecture. In medieval times, religion sought to liberate itself from all interference from worldly powers. Pope Gregory VII (1021-1085) established the authority and leadership of Rome as a reality in the West of the High Middle Ages. His manifest reads: "The Pope is the only human whose feet princes kiss." His opponent, Emperor Henry IV, who wanted his own government to appoint bishops, was once obliged to walk barefoot to Gregory in Canossa to get his excommunication annulled. This is a dramatic episode in the long process of separating the state and church from one another. The medieval church wanted, if possible, to control all other institutions. It saw economy, science, art, and ethics as subordinate to the church, and preferably government as well. In our day, we would call such religious hegemony over the other institutions of society "fundamentalism," and associate it with some variants of Islam. But in the Middle Ages it was the "Divine State." Medieval life was a creed: Credo in unum Deum Patrem omnipotentem. True, one worked in farming and animal husbandry, in handicrafts and trade, in tax and customs administration, in the duties and contests of a knight. But it was as a pilgrim in this world that one engaged in these mundane pursuits, to attain divine goals. 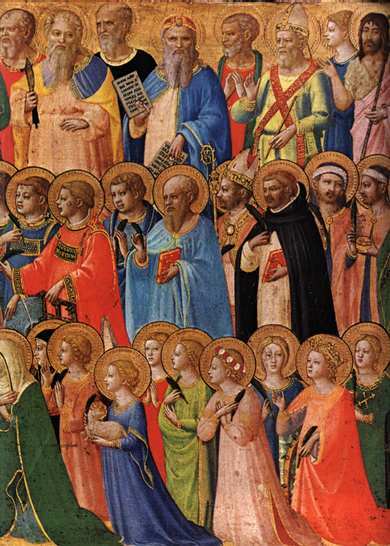 Look at the faces of those who did arrive to the communion of Saints in this detail from "Christ Glorified in the Court of Heaven" by Fra Angelico, a painting selected by the historian Arnold Toynbee to illustrate the religious goal of the period. The ecclesiastical year was the rhythm of the medieval epoch. Architecture and sculpture were "Bibles in stone." Literature was pious; music was Gloria and Kyrie elision; ethics and statutes were embroidery on the theme of the Ten Commandments; philosophy was theology; paintings showed Mary with the Infant Jesus and other scenes from the world of the Bible and the church. Wars were holy wars to the glory of God. The great cathedral enclosed everyone: its roof was high, accommodating not only priests and celestial beings but also inviting, and reflecting in its nave and transept, the world of the peasantry, bourgeoisie, nobility, and monarchy. The medieval strife between church and state ended differently in Rome and in Byzantine. It ended in a draw in Western Europe. The West-European idea expressed as "two swords," one worldly and one spiritual, prevailed. This abandonment of a single authority over human life is a most significant step in the structuration of Europe. In Eastern Europe, by contrast, the state became the victor, and the worldly ruler became also the head of the church. Thus, in most of Eastern Europe, one single sword prevailed. This "caesaropapism" i.e. the exercise of supreme authority over ecclesiastical matters by a secular ruler, meant that Eastern Europe became structured differently from Western Europe, a difference present to our days. The continued development of the structuration pertains only to Western Europe and to the areas of Eastern Europe with a Roman Catholic history. In some medieval cities, such as Venice, Genoa, and Florence, representatives of government, religion, and the economy balanced one another and none achieved total hegemony. The visitor to Piazza San Marco can see how the church, the palace of the doge (chief magistrate), and the various trading houses are equally imposing and keep each other in balance. In Florence a radical humanism emerged. Giovanni Pica della Mirandola (1463-1494) argued the thesis that human beings should be subject to no restraints: they are sufficient unto themselves, they are their own masters, freed from the "scale of nature." He signaled a process of liberation whose end we have not yet seen. At this time Machiavelli (1469-1527) taught that nobody could have built Sparta or Athens or the republican Rome and at the same time be morally good, least of all in a Christian sense. He showed how one made political calculations without allowing moral considerations to intervene. Statecraft began to be seen as something separate from ethics, an idea full of dynamite that it would take centuries for Europe to absorb. From the art of bookkeeping of Northern Italy developed commerce and industry, with a system of rewards separate from those of the state and the church. Neither church, nor state, determined any longer whom in the business community should receive honors. Honorary distinctions were, simply, linked to satisfactory annual accounts. The economy began to gain autonomy from state and church. It took several hundred years before the idea of an independent and decisive role of economic forces in society was accepted. In the middle of the 19th century Karl Marx shocked the world, not by his call for a proletarian revolution, but by his "historical materialism", i. e. the idea that the economy more than the church or the state is the author of history. The emancipation of science from religion was also a protracted process. After the death of Copernicus (1473-1543), his idea that the sun, rather than the Earth, was the center of the universe was banned by the church. The great physicist and mathematician Galileo (1564-1642) was prevailed upon by the church to deny the testimony of his instruments. Bruno (1548-1600) was burnt as a heretic after seven years' imprisonment for the sake of his philosophical ideas. One significant step toward scientific autonomy was taken in London when the secretary of the Royal Society, formally founded in 1660, started to keep notes of correspondents and dates when discoveries and theories were submitted to the Society and published. 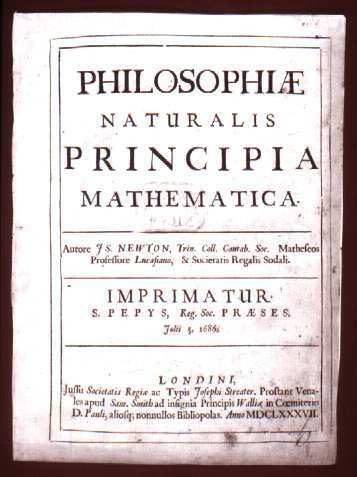 Newton's Principia, for example, was registered on 5 July 1686. Anteriority of discovery became the scientists' criterion of honoring their own: those who first published something new were acclaimed. Those wishing to use another person's discovery for their own reasoning had to acknowledge the originator in a quotation or footnote. Thus, science obtained its own system of rewards distinct from those of the state, the church and the economy. Newton's Principia. Registered on 5 July 1686. Rembrandt (1606-1669) belonged to an early generation of painters who were neither church nor court painters. He could choose his subjects freely, without reference to religion or government. Art became independent. 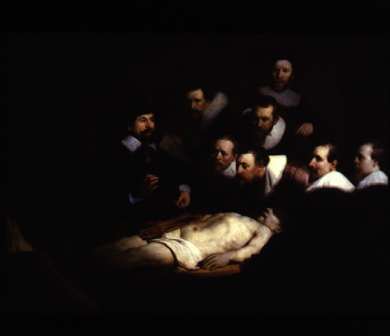 Rembrant's famous breakthrough painting, executed at the age of 25, "The Anatomy Lesson of Dr. Nicolaes Tulp," proves not only the artist's freedom but also the new freedom of science. The church had long opposed public dissections, which were considered intrusions into the sanctity of death and sometimes the serenity of the grave. 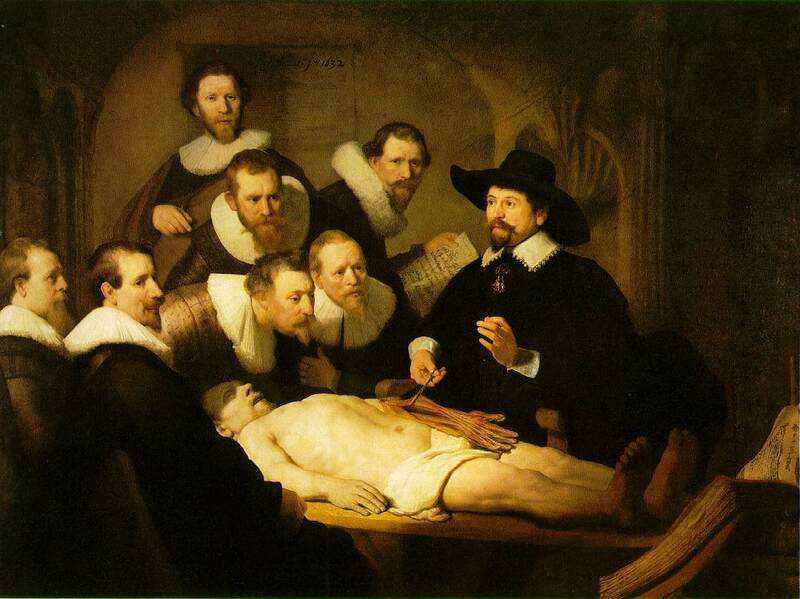 With obvious admiration Rembrandt painted his friend Doctor Tulp performing a dissection. The painting, showing the bright red of oxygenated blood, is very realistic. Much later art freed itself from science as well. Karl Philipp Moritz (1756-1793), one of Goethe's friends and a professor in the theory of fine arts, broke with the conventional principle that a work of art is a depiction of reality. "True beauty consists in the fact of an object meaning only itself, designating only itself, containing only itself, being a whole, realized in itself.". In other words, beauty was to be separated from any external description and explanation. Art became demarcated and independent of any other worldly and holy pursuits. By now all major institutional realms in Western Europe show considerable autonomy. This overview of the emergent autonomy of Europe's cardinal institutions is, of course, sketchy in the extreme, but it would be entirely incomplete unless we paused to consider the consolidation of liberalism in England in the second half of the 17th century. This was a turbulent and violent period in England: in half a century, the country underwent two revolutions and two civil wars; one king was executed and another exiled; there was an experiment in parliamentary republican government, and another in rule by a military protectorate. But toward the end of the century liberal ideas had become established as a safety net for the individual against the government. This safety net meant that the king was no longer above the law. Taxes could not be imposed without the consent of parliament. No one could be deprived of their freedom of movement and/or property without judicial proceedings under the law. No deprivation of freedom whatsoever was permitted for the purpose of stifling peaceful opposition. Freedom of the press and religious toleration were to prevail. Certain principles were to be inviolable, although from other points of view their violation might appear beneficial. Regulations prescribed by the authorities and law courts were thus to be maintained even in cases where they favored Crown opponents and the accused. In other words, the main thrust was directed against all forms of arbitrary government. Emergent English liberalism stood for what we nowadays call the rule of law and civic rights and freedoms. This constitutional liberalism in the restored English monarchy paved the way for economic liberalism. In the latter, the thrust was directed against government intervention in economic life and against private monopolies as guilds, or companies with exclusive royal privileges. Emergent English liberalism thus stood for what we nowadays call the market economy and economic freedom. Eventually the rights of the market place became recognized not only for nationals but also for foreigners. International capital became a fact. Thus, the contours of modern European society are clear. A monolithic multifunctional structure dominated by the state or the church has become differentiated into a pluralistic society in the form of six single function structures, each with its own cardinal value, its own system of rewards, its specific variety of freedom, and its particular version of rationalism. The consolidation of freedom in the various realms is a most important achievement. I wish to stress here that a philosophical ideal of individual freedom is not enough. Freedom must have its frameworks and checks and become concrete in the form of enforceable civil liberties, free trade, academic freedom, religious tolerance, freedom of conscience, and artistic freedom. The achievement of such institutionalized freedoms is the silver lining among the dark clouds of European history. The modern Europeans are by these arrangements offered the opportunity to create self-chosen biographies in their quest for wealth, order, truth, salvation, virtue, and beauty. It is sometimes said that Goethe was the last to achive them all. The European conception of modern man is an eminently choice-making creature shaped by a history of structural differentiation that forces choices between rather incommensurable values. The old thought of a unified and common good life that has run as a thread from antiquity to Enlightenment is not lost as a contemporary ideal. But, in practice, it is virtually impossible to live by for modern Europeans. The West-European cardinal institutions, i.e., government, the economy, science, religion, ethics, and art, are largely self-regulating and autonomous. They have what the German sociologist Max Weber called Eigengesetzlichkeit. Each treats the others as a setting or environment to which it must actively adjust; but none controls any other. Each has its own reward system and its own version of rationality. This is uniquely European. No other civilization than the western European has ventured to implement such extensive differentiation. This is a great experiment in history, an experiment whose success we cannot yet guarantee. The slow development of an independent ethics represents an apparent weakness in the modern European social order. One cannot claim that ethics in Europe is as well developed as art, science, religion, business and governance. In large measure ethics in Europe still exists within the confines of religion. Europe is now trying to make up for this deficit of strong independent ethical institutions. Improvements such as ethical committees at hospitals and research institutions, ethical watchdogs at financial markets, ethical ombudsmen at corporations and the media, ethical codes for the professions - all are under way. But they are mini-ethics of other institutional realms, not a realm in its own right for the creation of virtue. In the growing concerns for welfare, environment, and peace we may, however sense the emergence of an independent realm of ethics. The emergence of the new order with six relatively independent realms at first seem to tear man and society apart. It is reflected in paintings of the Cubist movement in which artists such as Picasso and Braque broke down the subject they painted into a number of facets, simultaneously showing several aspects of one object. This sentiments might be seen in many European paintings after 1910. Here ends the main argument of the lecture. Now follows some implications and applications. Click on Part III to continue the lecture.